At Active Life Laser Pain Center, we understand that knee pain can put a damper on your lifestyle and cause chronic soreness and limited mobility during your normal day to day activities! Our specific step-by-step protocol utilizing the most modern technology available can provide the solution you are looking for. 4 laser treatments and I haven’t had any (knee) problems for 6 months now. Knee pain can have many root causes including accelerated wear and tear caused by work or daily activities as well as acute injury due to a traumatic event such as a sports injury or fall. The knee joint can develop degeneration as well as cartilage tears and ligament damage. We will address the cause of your pain and focus on getting you back to your active lifestyle as quick as possible. Visit Dr. Robert Hanopole and his associates right away for a free consultation and evaluation to determine if you are a candidate for our Knee Pain ReliefNow Laser MethodTM. NOTE: For those traveling to us from out of town or outside the continental US, please ask about our special travel arrangements! and how it can relieve your pain! Based on scientific research pioneered by NASA, the patented pulsed-wave technology will safely help treat any inflammation and pain you’re experiencing. 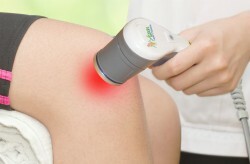 Our FDA-Cleared laser will painlessly address your knee condition by reducing the pain, swelling, and inflammation while stimulating the cells to regenerate damaged tissues.